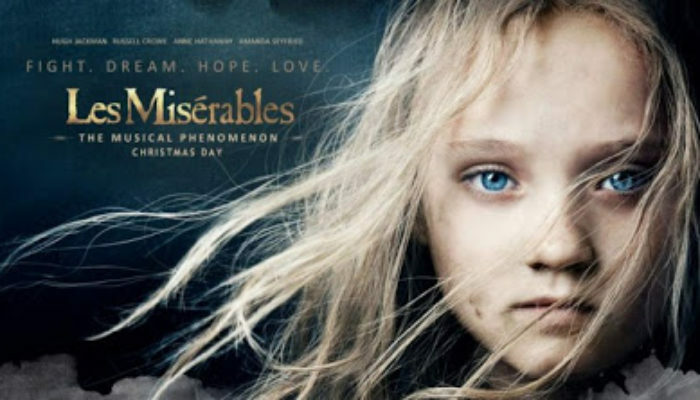 This is as great a film version of the stage musical Les Miserables (based on the inspired novel by Victor Hugo) as likely could be made; what flaws it has are carried over from the stage production. With numerous story threads (the novel is immense) crammed into 2 hours and 40 minutes, the film moves at a surprisingly steady clip. This is both a blessing and a curse: a few of the songs are either truncated or omitted and the pacing is such that the film moves from one big song to the next, with little transition or time to let the story breathe. It occasionally feels repetitive and some plot points seem to appear almost out of nowhere. Fortunately, the songs are marvelous, the acting is superb, and the tale of compassion, charity, and redemption through Christ is as powerful as ever. 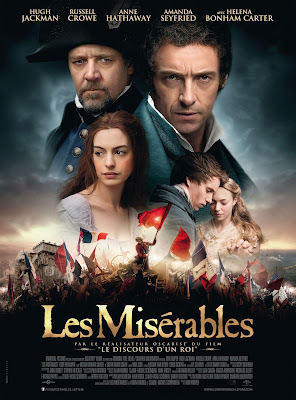 Though the cast is a large ensemble, the success or failure of Les Miserables rests squarely on the broad shoulders of Hugh Jackman in the lead role of Jean Valjean, a convict in 1800's France who breaks parole in order to escape his past. 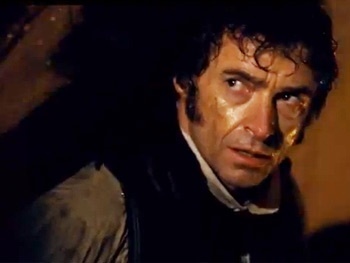 Jackman, best known to mainstream audiences as Wolverine from the X-men films, is also a Tony-award winning Broadway performer with ample experience in musicals. I knew he could sing, but I wasn't prepared for the level of raw emotion he taps into with his commanding and superlative performance. He's brilliant here, a sure lock for a Best Actor nomination. Anne Hathaway also stuns in the brief, but crucial, supporting role of Fantine, an impoverished single mother who takes up prostitution to provide for her daughter. Delivered in one agonizingly beautiful take, her rendition of “I Dreamed a Dream” may be the most heart-wrenching moment of of the year. Many have worried that Russell Crowe is too undeveloped as a vocalist to portray Javert, the justice-obsessed lawman who hounds Valjean for his whole life. 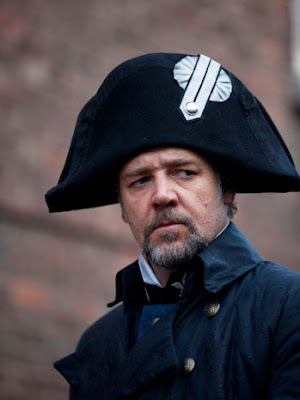 Though Crowe is clearly a thespian first and a vocalist second, his acting is so good that only theater snobs and vocal majors are likely to take issue with his singing (similar to how Gerard Butler in The Phantom of the Opera was adequate as a vocalist, but nailed the character). When Crowe belts out the notes his voice sounds rock-n-roll harsh (fitting for the roughness of the character), so he wisely reigns it in for his big solos. Songs like “Stars” are normally big vocal showcases, but Crowe, staying within his range, turns them into gentle, thoughtful melodies that sound quite lovely. The rest of the cast acquit themselves well. As young Cosette, the daughter of Fantine who Valjean raises as his own, Isabelle Allen is perfectly cast, eliciting empathy from the audience immediately with her rendition of “Castle on a Cloud.” Amanda Seyfried (Mama Mia) plays Cosette later as a young woman. Though she sounds a bit like Snow White, she does fine. 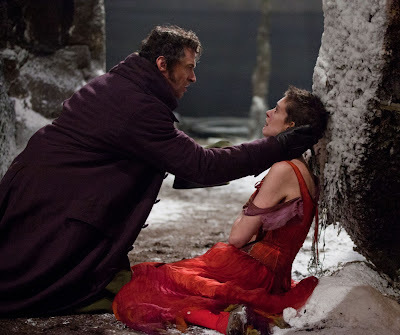 Her romance with the young revolutionary Marius (trembling tenor Eddie Redmayne) is rushed and doesn't earn the importance it is supposed to carry, but that was also true of the play. 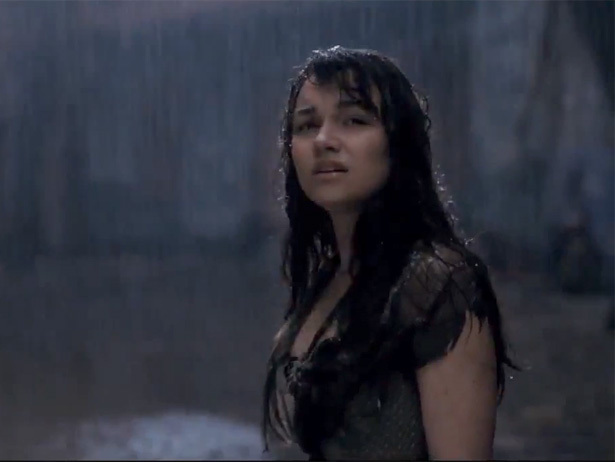 As Eponine, Samantha Barks does a wonderful job of portraying the angst and the sass of the tomboy who pines for longtime friend Marius. Barks was hand-picked for the film version after playing the character onstage in London for years. Her heartache is palpable, and she easily makes the transition from grandiose stage performance (where performers sing to the back of the theater and necessarily over-emote to register with a distant audience) to the more intimate and up-close performance style of film. 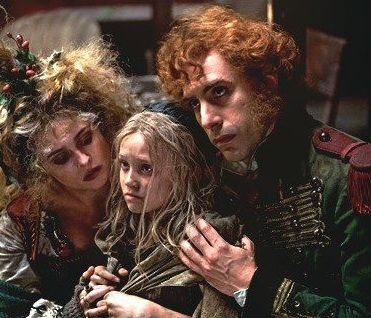 Sacha Baron Cohen (Hugo) and Helena Bonham Carter (Harry Potter) have terrific comedic timing as the manipulative, pocket-picking Thernadiers, though their signature song, “Master of the House,” is a crass and vulgar (albeit catchy) showstopper that has always seemed out of place in this virtuous and decidedly Christian story. All good morality tales have to portray evil to contrast it with good, and the Thernadiers, along with the glamour-free and sad depiction of prostitution as society's underbelly, serve that very purpose. Colm Wilkinson, who originated the role of Jean Valjean in London and on Broadway, returns here nearly 30 years later, now as the elderly bishop who sets Valjean on the path of redemption through Jesus Christ. 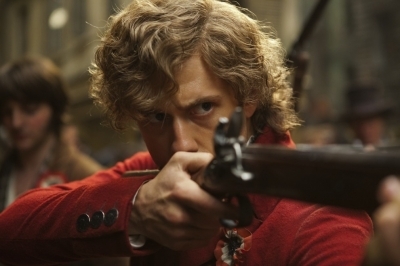 In addition to being a nice treat for Les Mis fans, Wilkinson is perfectly cast as the man of God, his voice and demeanor the very embodiment integrity and love. 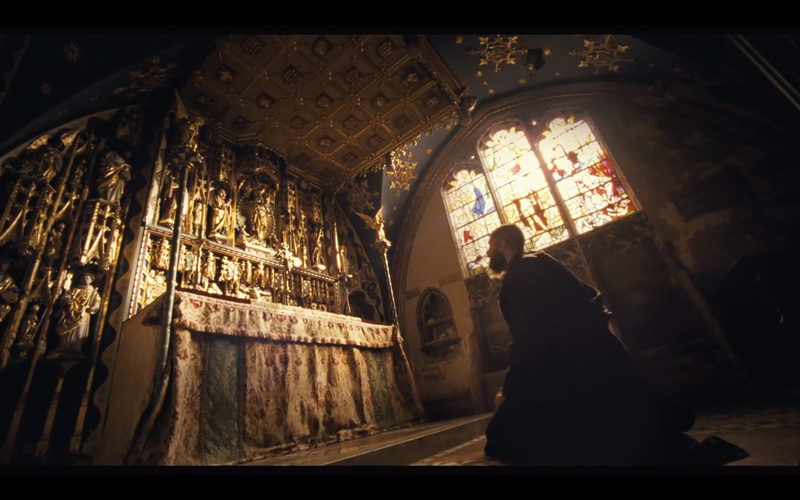 It is to the film's enormous credit that it doesn't dilute the story's spirituality. Director Tom Hooper explained “You have to tell this story from the point of view that God exists, and what God means in practice is the act of compassion, the struggle of living your life in a moral way” (read the whole article here). That's something that believers and nonbelievers alike can respond to. As for the film-making, the much-hyped decision to record the actors singing live on set (as opposed to lip-syncing to songs they'd pre-recorded in a studio) proves effective, lending an emotional authenticity to the scenes without sacrificing, as was feared, much by way of quality. The wardrobe and sets are first-rate, and while some have complained about director Tom Hooper's overuse of close-ups, long takes, and low-angle shots, none of these bothered me. The film was quite lovely to look at, with judicious and gorgeous use of visual effects. All told, Les Miserables is a grand musical drama that balances an epic scale with intimate characterizations. It should delight fans and win over newcomers. CONTENT OVERVIEW: Les Miserables is rated PG-13. It has a handful of mild and moderate profanities. Battle scenes show student revolutionaries, soldiers, and citizens shot and stabbed (it is bloodless in the moment, though the aftermath shows blood flowing in the streets). There are a few crass song lyrics. A woman becomes a prostitute to keep her child from starving. 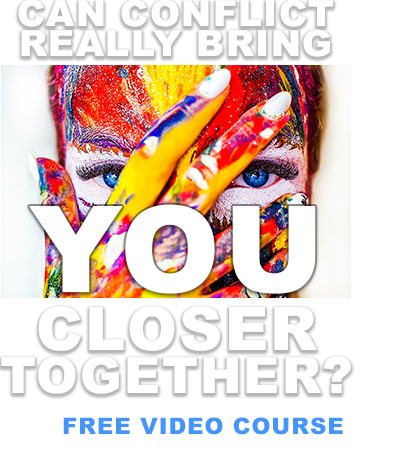 For a few seconds we see a man on top of her (from the shoulders up and both are clothed) having just finished; she is crying silently and the moment is meant to be heartbreaking, not arousing. During the song “Master of the House” a prostitute is seen for about one second lying on top of a man dressed as Santa Claus (both are clothed), but the raucous lifestyle is shown to deliver no happiness. A man jumps off of a bridge; his body slams hard onto the water. Two men are covered in filth as one drags the other through the sewers to save his life. MESSAGES TO DISCUSS: Charity is the pure love of Christ; it is displayed in patience, kindness, humility, compassion, and forgiveness, and those who are possessed of it can face death with confidence and peace (1 Corinthians 13:4-8; Moroni 7:45-47). Love leads to a forgiveness of sins (Luke 7:47; 1 Peter 4:8). No matter your past, you can change and be a better person (Isaiah 1:18). For a second opinion, check out my buddy Grady Kerr's take over at Mormon Media Reviews. What's With All the Hatha-hate?